Is this TDR the maddest place to put a YPVS motor? If there’s anything that Yamaha know how to build it’s two-strokes, and back in the 80s they were on a roll. From the legendary LC to the TZR series, the marque of the tuning fork were experts in all things stinkwheel. Where they led, others followed. 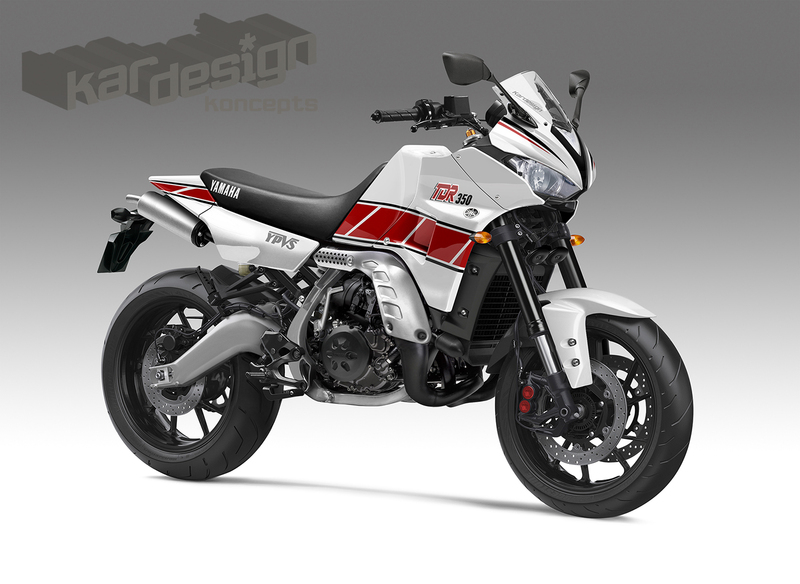 High on sales success, Yamaha popped an acid tab and gave the world the TDR250 – essentially a geared-down TZR 250 with wide bars – and called it the ‘Ultimate dual’ to give it the impression it could go off-road. It was every bit as bonkers as it sounded and lasted a full five years before production finished in 1993. Here it is re-imagined via the power of Photoshop. Oh please, can’t someone build it? While the original 250cc parallel twin was a retuned TZR250 with lower gearing, the truth is despite the wonders of YPVS broadening the powerband it was still a peaky engine with not a lot going on below 6000rpm. Which is where the 350 Power Valve motor comes in. From a true 45bhp to a reliable fuel-injected 70bhp in one move, the torque figure is up too so it’ll pull from lower down the rev range. Speaking of which, the tacho from the original ludicrous positioning on the fuel tank is now on the usual place in front of the handlebars. 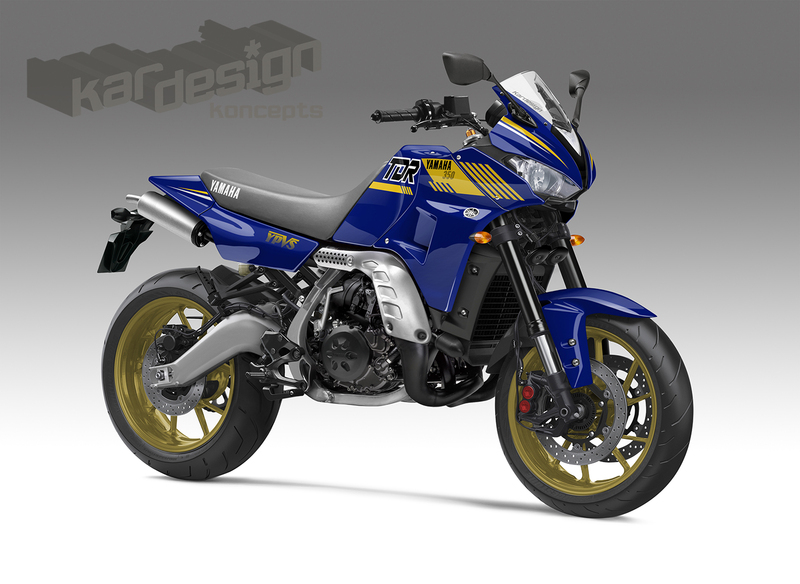 In 1988 the TDR used a cradle frame that was a halfway house between off-road and road-based. This remixed bike is now box-section, wheels are cast alloy, forks are adjustable USD items and it sports a twin-disc radial set-up in place of the single. There are pillion pegs but the short seat on the TDR remains – we don’t want to encourage passengers on a bike like this now do we? The TDR’s minimal bodywork is retained – it was sturdy enough in a crash which is a big advantage when riding an eccentric, high-powered stroker. The main upgrade here is in the headlight: the previous item was notoriously feeble so there’s a twin-light array which automatically dips when the front wheel rises, which we expect it will do a lot when it hits that power band. 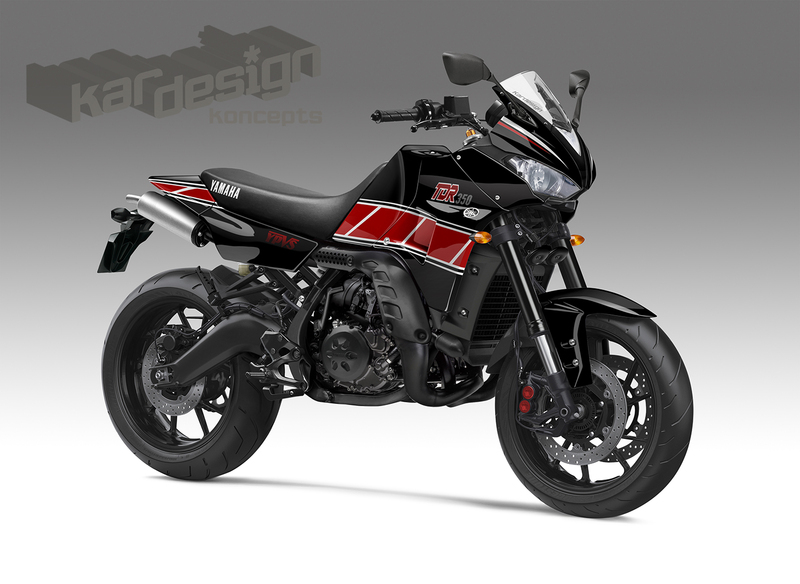 Did Yamaha copy Kardesign’s R6 headlights?